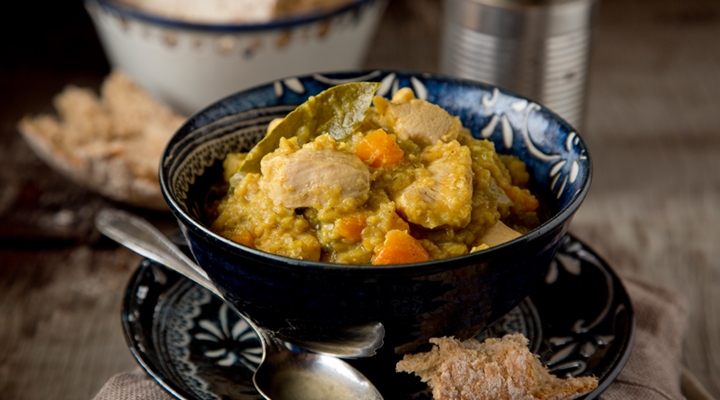 This chicken and lentil stew is the perfect mid-week meal to warm you up on a cold winter night. 1. Heat the olive oil in a medium saucepan set over a medium heat. Add the onion, carrot, celery and salt and stir to combine. Cover with a lid and let the vegetables sweat for about 5 minutes, until the onion is soft and translucent. 2. Add the diced chicken, lentils, stock, curry powder and bay leaf. Bring to the boil, then turn the heat down to low and simmer, covered, for 25 to 30 minutes, until the lentils are starting to fall apart and the chicken is cooked through. 3. Remove the saucepan from the heat and stir in the lemon juice, if using. Add salt to taste. Ladle into bowls and serve. Really straightforward and simple recipe! Quick to make, and delicious! I made it because I had all the ingredients already at home, no tricky or unusual ingredients. I put it into the oven once it was boiling to cook and it worked just the same. It's a good recipe if you have children.